Some details on the exhibition are given in the press release to promote it to the media. 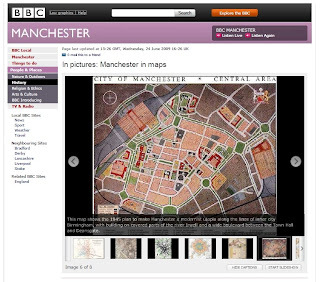 BBC Manchester have featured a slideshow of images from the exhibition, including the city centre map from the 1945 Plan. A couple of pictures of display cabinets in our Mapping Manchester exhibition from the initial fit out. Above is part of the 'city and the car' cabinet and below is the 'industry' one. The exhibition opens on Thursdays 25th June. 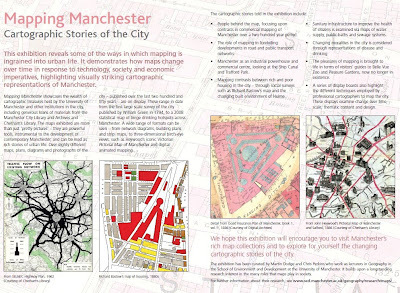 Some more information on my Mapping Manchester exhibition is given in this leaflet. Download a PDF version from here. For the last few months I have been putting together a public exhibition with my colleague Chris Perkins. 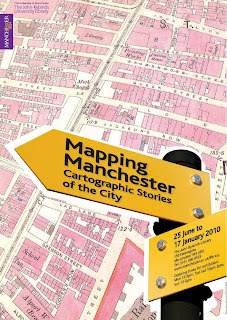 The exhibition is entitled Mapping Manchester: Cartographic Stories of the City and it is due to open on the 25th June 2009. The promo poster image is shown above. The aim of exhibition is to reveal some of the ways in which mapping is ingrained into urban life. It seeks to demonstrates how maps work and change over time in response to technology, society and economic imperatives, highlighting visually striking cartographic representations of Manchester. 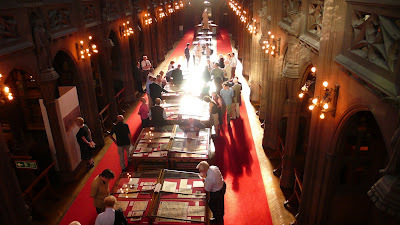 It showcases the wealth of cartographic ‘treasures’ held by the University of Manchester and other institutions in the city, including generous loans of materials from the Manchester City Library and Archives and Chetham’s Library. 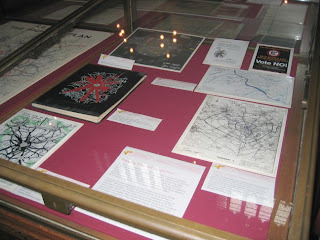 The maps exhibited are more than just ‘pretty pictures’: they are powerful tools instrumental in the making of the contemporary Manchester, and can be read as rich stories of urban life. 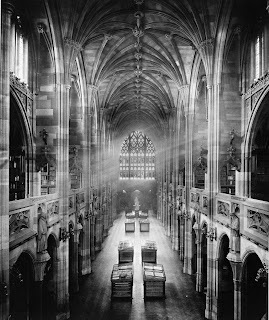 The exhibition is being held in the Reading Room of the John Rylands Library on Deansgate in the central Manchester. A historic picture of the Reading Room. I hope that we get some visitors. 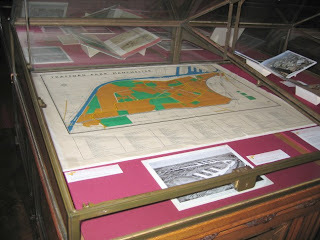 I will post details on the maps in exhibition in future blog posts.